What services does the YWCA of the City of New York provide? The YW is a multi-service organization providing services to under-resourced communities in New York City. Services are provided through Elementary and Middle School After-School Programs, and YW’s Girls Initiatives, which includes STEAAM (science, technology, engineering, activism, art, and math) training for high school girls, and girl’s leadership and empowerment initiatives. We no longer offer housing accommodations, temporary housing or room rentals or job training services to under or unemployed women. Who does the organization serve on a yearly basis? The YW serves over 1,800 New York City women and their families. We strive to eliminate racism, empower women and stand up for social justice by providing community-specific programming in locations across Brownsville, Coney Island, East New York, Midtown West and Harlem, and at our Midtown West Family Resource Center. The communities that we serve are distinct, culturally diverse areas whose economic progress has significantly lagged behind other neighborhoods in New York. We are committed to ensuring that these community’s children and families have access to the resources, tools and opportunities they need to survive and thrive. Where does the YWCA of the City of New York operate? Headquarters for the YWCA of the City of New York is located in the Financial District of Manhattan. Our programming locations are in Brownsville, Coney Island, East New York, Hell’s Kitchen, and Harlem. Is the YWCA-NYC part of a larger YWCA movement? 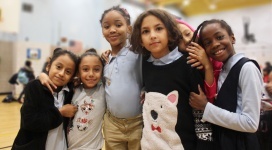 The YWCA-NYC is independently owned and operated, but is connected to a worldwide network of sister YWCAs that serve 25 million people, in more than 100 countries. Throughout our history, the YWCA has been at the forefront of most major social movements, serving as a pioneer in race relations and the empowerment of women. Visit the YWCA USA website to learn more. How is the organization funded? The YW is funded through a combination of public and private funding. The proportion of funding varies by program. We currently receive about 60 percent of funding from city and state sources; the remainder is donated by foundations, corporations and individuals. How can I make a contribution to the YWCA-NYC? The YW is a 501(c)(3) non-profit organization. All contributions are tax-deductible to the extent allowed by the law. The YW accepts individual gifts, corporate and foundation gifts, stock gifts, legacies and bequests, matching gifts, United Way designations and in-kind contributions, such as printing, professional services or property. For more information, please contact Chief Operating Officer, Caroline Young at 212.735.9781 or cyoung@ywcanyc.org. To make a contribution, Donate here. How do I contact the YWCA-NYC? Please see our Contact Us page. Cultural, physical and academic enrichment for elementary school children. YW’s mission is dedicated to eliminating racism, empowering women and promoting peace, justice, freedom and dignity for all. YWCA of the City of New York is a 501(c)(3) organization and all contributions are tax-deductible to the fullest extent of the law.